From the age of ten to 20, I wrote a diary most days. When each volume was full of scratchings, I’d put it away – first on a shelf, then as I got older and more privacy-conscious in a drawer, and eventually in an old leather suitcase that I could keep clipped shut on top of my wardrobe and out of my eyeline. When my childhood bedroom got dismantled and my effects put into boxes and stowed in the spare room, the suitcase went too. Every visit, my mum would ask me to please decide what I wanted to do with my old things (soft toys, a mountain of C90s, Dorling-Kindersley Eyewitness guides, a Johnny Ball branded microscope and a lace-making pillow) and I’d promise to sort it out before I went away again; every visit, I’d feel a terrible heaviness about that suitcase, and somehow it would be time to go home before I’d had a chance to deal with it. “You can just throw it all away,” I’d say, guiltily, but my mum didn’t seem particularly taken with the idea of purging my trash for me. Anyway, I’d kept the diaries so long because I’d thought they must have some value. For almost as long as I’ve been able to write, I’ve wanted to be a writer, and those perfect-bound notebooks and repurposed exercise books were my greatest – biggest, anyway – work. Writers don’t just chuck their writing away, I thought. In those volumes were years of friendships, first crushes, family holidays, bands I loved and school memories. 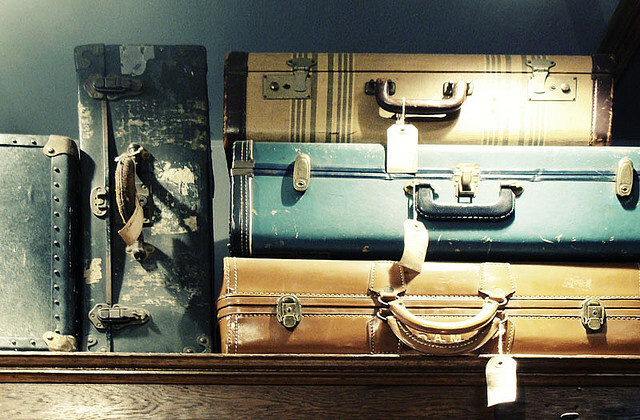 If I had written 500 words four times a week for a decade (which seems like a reasonable estimate), I probably had something like four million words in that suitcase, and some of that had to be better than landfill. I could remember bits of it. Like the entry I wrote after my nana died following a long and horrible decline punctuated by strokes, which had the line “death hangs over and about me”. The furious entry on a boy who had slighted me, where I accused him of having a “vermiform soul”. All I could remember, in fact, was that these diaries were full of fury and bleakness. I remembered sitting at my grey plastic desk and writing them in a sort of fugue state, phrases propelling more phrases through my pen and a feeling of scorching purity as each one fell. I could remember sometimes crying as I wrote, and feeling a grim satisfaction that the inky splashes would validate the emotions I recorded. I could not remember writing very much about happiness or love. Not the family dinners I strive to replicate now, not the small and happy successes I found in schoolwork (especially English), not the cheerful Fridays when me and my mum and dad and sister would pile on the sofa and watch sitcoms together. From the age of 11 to 16, I was quite ill. Insomnia and depression were routine; then when I was 14, I had a bout of glandular fever which laid me extremely low and which finally made my underlying symptoms impossible to hide from my parents. After my sick leave turned into obvious school avoiding, my dad drove me to the GP where I made the awkward and choked confession that I “just couldn’t stop crying”. Counseling followed. First with a very nice talking-cure lady who I nearly drove crazy with my angry silence (“You are like an onion, there are so many layers to get through,” she said tersely, before referring me on to someone else); then with a smiling and pragmatic practitioner of cognitive behavioral therapy, who I told myself I was tricking every time a session ended well, and who in a few weeks managed to orchestrate my escape from the miseries that had eaten most of my teens. Soon after that, diaries got less interesting. I got better, and I felt lost. I remember writing an entry where I diagnosed this feeling as bereavement: for the best part of a decade, I had written compulsively, and the subject of that writing had been my own unhappiness. But the words in the suitcase hadn’t just been descriptive. They were incantations, drawing forth and feeding on the misery to make more of it. What was interesting to me was my own unhappiness. Even though my life wasn’t exclusively characterised by these feelings, my idea of myself was, and everything I chose to write about would reinforce this. I hated it and I hated myself, but having written ever other state out of my own life, it seemed a choice between being depressed and being nothing. The writers I was obsessed over at the time (that is, the very worst time) were similarly self-dramatists of despair. Lots of Plath. Plenty of Richey Edwards. I remember starting on Kafka but not really understanding that he had a sense of humour. I gave the diaries one chance to prove they were something other than medical waste, only good for incineration. I opened one up. What I saw was a description of a confrontation at school – me being bullied (though like most people, I certainly put my time in on both sides of that unpleasantness; Margaret Atwood’s Cat’s Eye stung me hard when I read it). What hurt most wasn’t the event, which involved a tormentor whose name I’ve forgotten and an occasion I couldn’t recall. What hurt most was the writerliness of what I’d written, the obvious effort to make this record of an unpleasant thing – written only for my own benefit – as powerful as it could be in conveying emotional devastation. There were no tear splashes, so obviously my technique had been lacking this time, but I recognised the awful infatuation with the effect of my own words all the same. I bundled all the diaries in a bag and dropped them in my parents’ wheelie bin, and with them, hopefully, goes any chance of being that kind of person – that kind of writer – again. There goes your chance to appear on Radio 4’s My Teenage Diary, where people read from (and have a bit of a laugh at) their teenage outpourings! Seriously, I admire your ruthlessness in throwing them out. I have all mine stashed in a filing cabinet, and they go on and on (and on) into adulthood. But often when writing I was in “venting” mode. Increasingly, I’m a bit embarrassed to look back on them, and am seriously wondering why I keep them. Mostly, they’re not as interesting as I thought they were! Do I really want my children to inherit them? I’ve been much less of an on-paper diarist since facebook and twitter came on the scene, coincidentally. Sometimes discovered diaries really are fabulous, though. Joan Wyndham’s wartime diaries (‘Love Lessons’ etc) are brilliant. A very interesting account, Sarah. I burnt a few years’ worth of mine (late teens, early 20s) after realising they had next to no value, even sentimental. Instead, they were deeply embarrassing: all that earnest angst and self-conscious self-pity! But the Tony the Tiger diary I kept sporadically when I was about 10? I’m so keeping that – for posterity and hilarity. I hated my teenage diaries even as I was writing them. But have started keeping an intermittent comic-strip-style diary through little sketches, which feels much less fraught – lighter, and fun to look back on. It’s hard to be angsty in stick figures. What a strange entry Sarah. Brilliant and sad and eventually triumphant. I like it. I like it a lot. Great entry. This sounds quite a lot like my own teenage experiences, although I bet your writing was a whole load better. I almost shudder when I remember my appalling attempts at poetry. I always enjoy reading your blogs. This one resonates with us all I think. I too, kept a teenage diary and reads so awkwardly and over emotional. A spilling of the guts. Yes, over emotional and repetitive (church, Irish dancing features over and over.) Yeah, bin ’em. Out with the old… and yes, I cringe at the bad poetry I used to write too.